Quebec City Is Building A New Hockey Arena, Will An NHL Team Follow? Quebec hockey fans are one giant step closer to getting their wish of having an NHL team in their capital city.Premier Jean Charest and Quebec City Mayor Régis Labeaume will announce plans shortly to build a new $400 million hockey arena in Quebec City. The cost will be split between the city and the province. 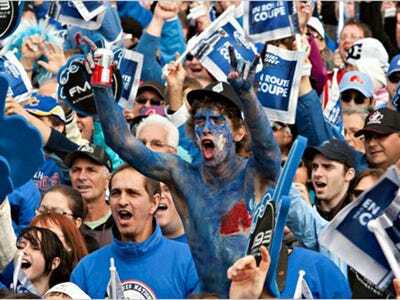 The Quebec Nordiques left town in 1995 and since then Quebec’s hockey fans have been clamoring for a replacement. Earlier this year, 1,100 fans journeyed to an Islanders game at Nassau Coliseum in an attempt to show Commissioner Gary Bettman that Quebec is fully capable of supporting an NHL team. The arena was one major obstacle, and the much stronger Canadian dollar will also be a major help. With so many NHL franchises in financial trouble, the new arena might be the final selling point that gets Quebec its team.